Why Should Fifth Graders Learn to Program? Click on the image to play this game designed by a student at a Los Altos elementary school. “Can you test my app?" These are not remarks at a Silicon Valley technology startup, but from an animated conversation in a classroom of 10- and 11-year-olds in the Los Altos School District in California. These fifth- and sixth graders are experiencing the excitement of computer programming through Scratch, a tool designed by MIT. They are creating their very first fully functional program. As part of a district-wide program called Digital Design that I teach, every student from fourth through sixth grade is exposed to computer programming in addition to 2D and 3D design. 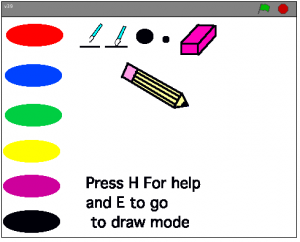 The first assignment this trimester was to create a drawing program – a computer version of the popular Etch-A-Sketch toy. Students learned some fundamental programming concepts, then wrote their own programs. The project was deliberately open ended and the creative results surprised me. This is a case of everyone learning programming in school, not the select few who know that they want to and can afford to take an expensive computer camp. Most of these students have never programmed before, and certainly did not think of themselves as computer experts. But in less than two hours (three classes), they created programs with help menus, keyboard shortcuts, menus to change colors, brushes, paper and more. Imagine what they could do with a little more time and experience! The second project was to create a simple video game, and it was constructed in five classes. Students learned programming concepts such as iteration, conditionals, and variables in the context of game design. As before, the the students showcased their originality. Here's an example: Use arrow keys to collect bananas without touching the dino. About 900 students have learned programming through Scratch in the last 2 years via the Los Altos School District’s Digital Design program. The examples shown are just a small sample taken from the last trimester. More Scratch projects can be found on the Digital Gallery on this website. What is particularly remarkable about these projects is that every student in the public school district takes this class. The projects are not just made by students who are already predisposed to computers – the "wanna-be computer geeks." One student told me right at the beginning that she does not like computers. The class also includes English language learners who just transferred to the school district. There are also several special education students who are mainstreamed for this program. This is a case of everyone learning programming in school, not the select few who know that they want to and can afford to take an expensive computer camp. The most exciting part for a computer scientist and Silicon Valley resident like myself is that some of these kids are now passionate about programming. They are working on Scratch projects during recess and at home (Scratch is a free download from MIT). Eventually, one of these kids may go on to create the next Hewlett Packard, or the next Apple or the next Google. I like to think that the future of Silicon Valley is in good hands; this new generation of creative computer programmers will keep our innovative spirit alive. This article was posted on Digital Art for All by Sheena Vaidyanathan, who teaches 3D design and computer programming to students in the Los Altos School District in California.